It’s been a while since I left my 5MR so when my friend Courtney from Bend mentioned she’d be in town for some bird-watching adventures I rearranged my schedule so I could join her. We knew our first target, a Rose-breasted Grosbeak visiting a feeder near Corvallis. I’d only seen RBGR briefly in Michigan last summer, so I was excited to catch up with one in Oregon. We got to the feeder bright and early, and felt very welcomed. Thank you Bruce! The grosbeak arrived just 8 minutes past her regularly scheduled time, and then she sat for 20 minutes on top of the feeder. We worried a Cooper’s Hawk would swoop right in and eat her. But after posing nicely, she finally hopped down to the feeder and ate some sunflower seeds. Then a Hutton’s Vireo distracted us. And we looked back and saw the grosbeak had gone. She was in the trees above for a minute and then flew away. 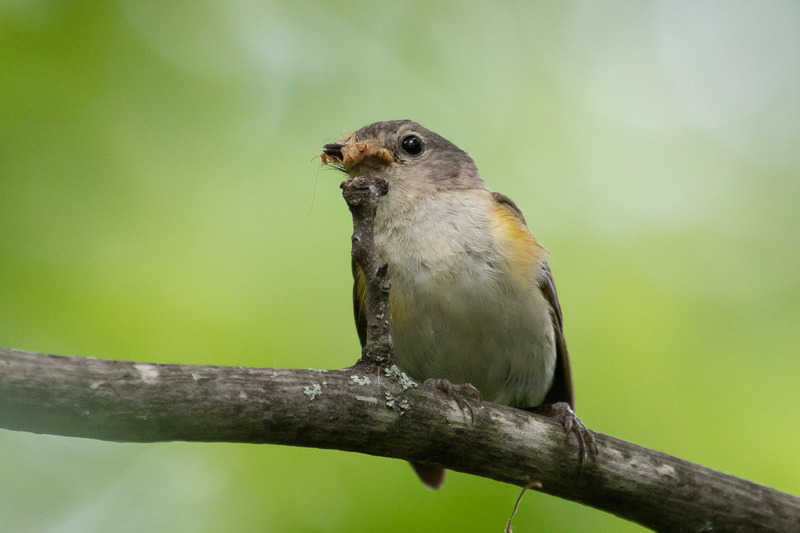 The experience was best case scenario for a feeder bird. 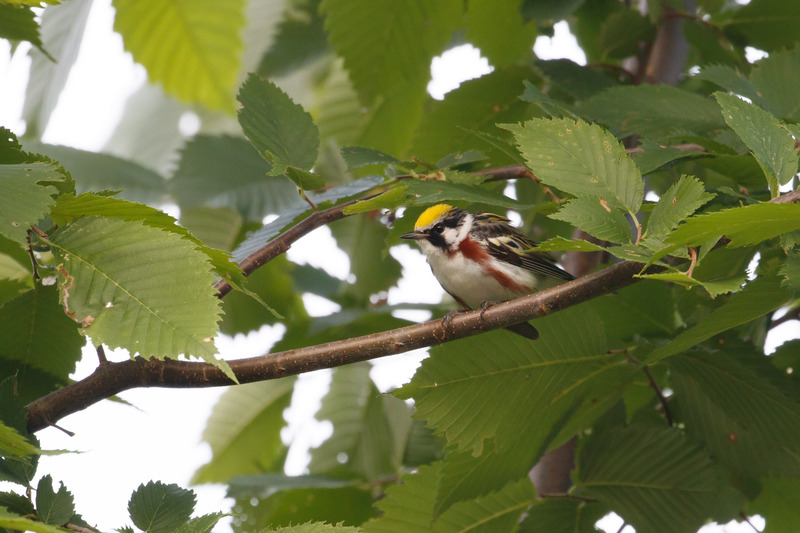 Such a good grosbeak. From here Courtney and I looked unsuccessfully for the Tundra Bean-Goose at Finley NWR, but we saw FOY Tree Swallows! 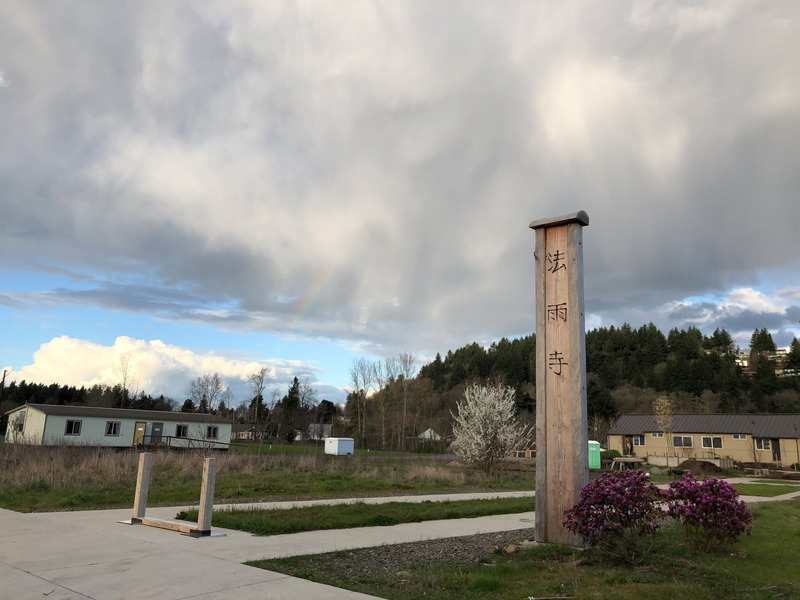 Then we dipped on a Glaucous Gull at a nearby landfill, but we lucked out with Tricolored Blackbirds hanging out at the Philomath Poo Ponds. It was a good study of these birds next to Red-winged Blackbirds. They are obvious and not obvious depending on the lighting conditions and their proximity to one another. I’m not positive I could recognize a tricolored without knowing they were around. And forget about the females. Feeling satisfied we headed back to Portland, until we checked our emails and read that a Gyrfalcon had been spotted minutes away from where we stood earlier. Dang! It had been two years since I’d seen a Gyrfalcon with Jen (in the same area), and this would be a lifer for Courtney so we turned around immediately but we were unable to relocate the bird. What we did find were clouds of shorebirds. Dunlin and Black-bellied Plovers put on an unforgettable show. And at the end of the day we found one falcon, a Peregrine munching on a Killdeer. 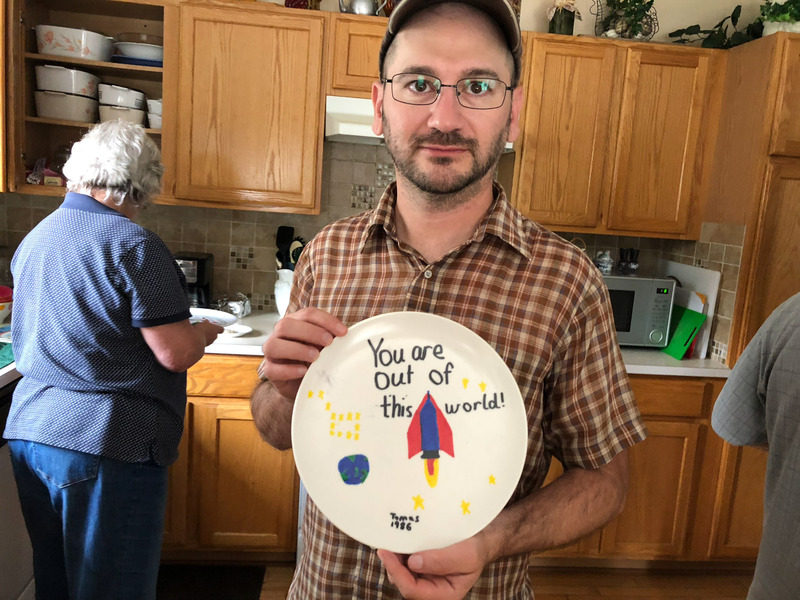 After, we stayed at our friend’s Nick and Maureen’s house in Albany to try for the gyr again in the morning. Which ended similarly to the day before, no Gyrfalcon but lots of good consolation birds including FOY Turkey Vultures and and a Say’s Phoebe. 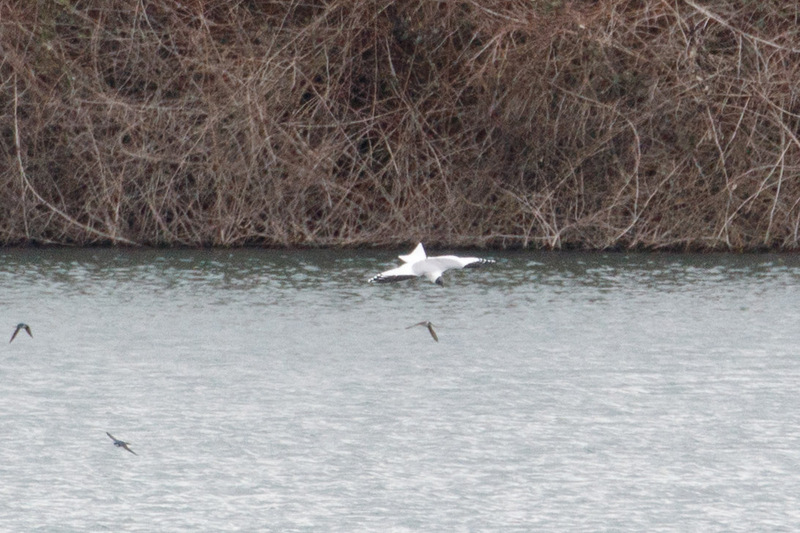 We made it back to Portland, where we looked at a couple of birds, hello again Tufted Duck and hello 5MR Barn Owl. Before the decision was made to go back and look for the Gyrfalcon a third time. I forgot my wallet at Nick and Maureen’s house the night before so I had even more incentive. And we brought Sarah and Eric this time as reinforcements. Even so, the gyr eluded us. 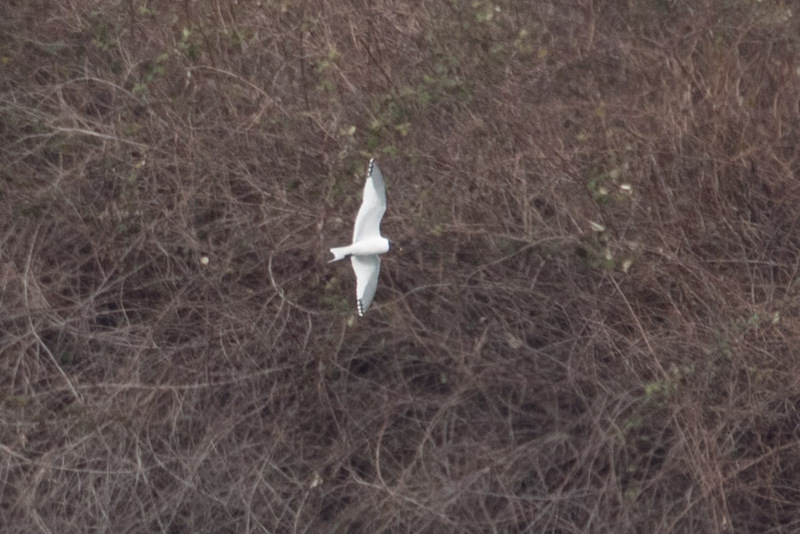 We added a few more county birds and got good looks at a Prairie Falcon (terrible photos, sorry). Eric ended with over 100 species in Linn County, I ended at 82. It was a solid three day effort, no one can say we didn’t try. When not visiting family, Tomas and I spent our mornings at nearby local parks. His family lives in Grand Blanc, MI a suburb of Detroit, just south of Flint. There were lots of places to choose from. Michigan is flat and it reminded me a little of Florida, lots of lakes and thick woodsy forests making for challenging birding conditions. I did my best. We pulled up to the entrance of Holly Recreation Area and I immediately hopped out of the minivan. 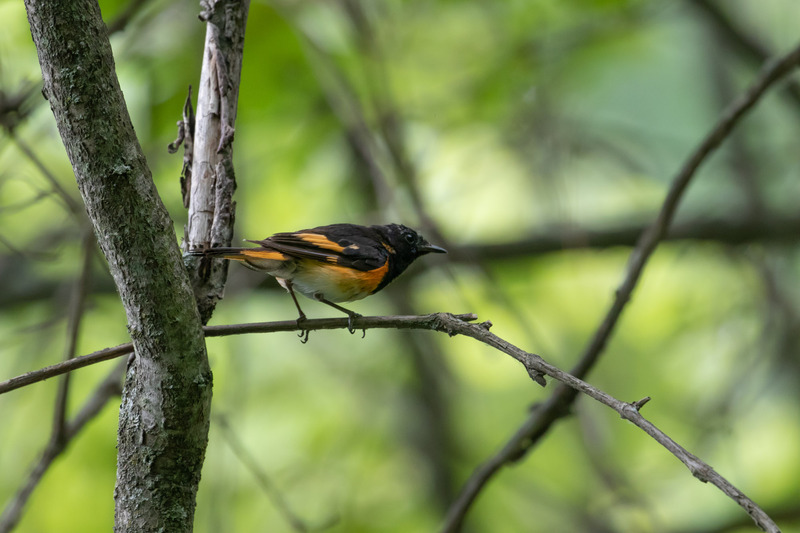 There was a flurry of bird activity, Gray Catbird, Cedar Waxwing, Downy Woodpecker, Red-bellied Woodpecker, Eastern Wood-Pewee, a thrush calling later identified as Veery, and my lifer Eastern Towhee! Looks just like spotted, minus the spots! Then I noticed a small warbler. Two life-birds and we hadn’t even made it past the front gate. I would have been happy just hanging out there, but more cars pulled up and we eventually had to go in. 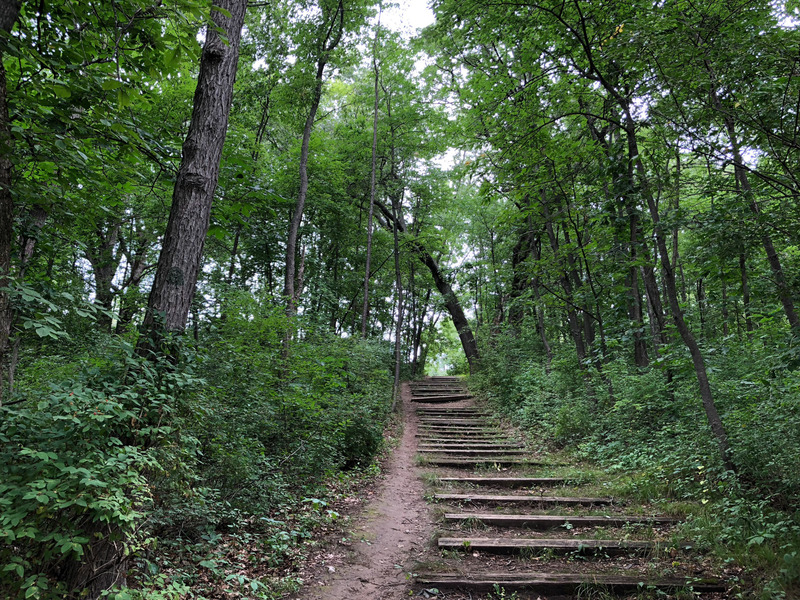 Tomas went for a barefoot run on the trails, while I spent my time exploring the dense forest. The birdsong sounded exotic and I was pulled in all directions. Where to begin? Eventually I focused on (less exotic) robins alarming in the distance that led me to a Barred Owl deep in the forest that flew before I could get pictures. Still a cool experience. 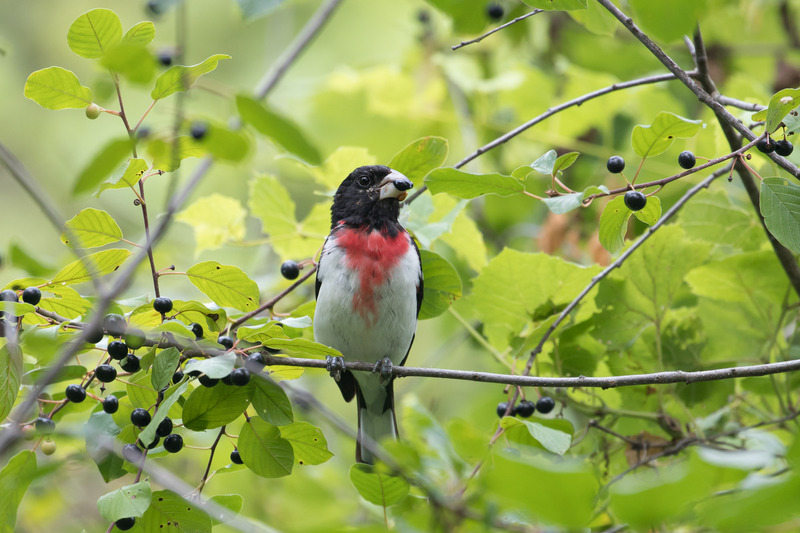 I followed more singing that finally led me to another life bird, a Rose-breasted Grosbeak! That guy doesn’t know how happy I was to see him. It was incredible. 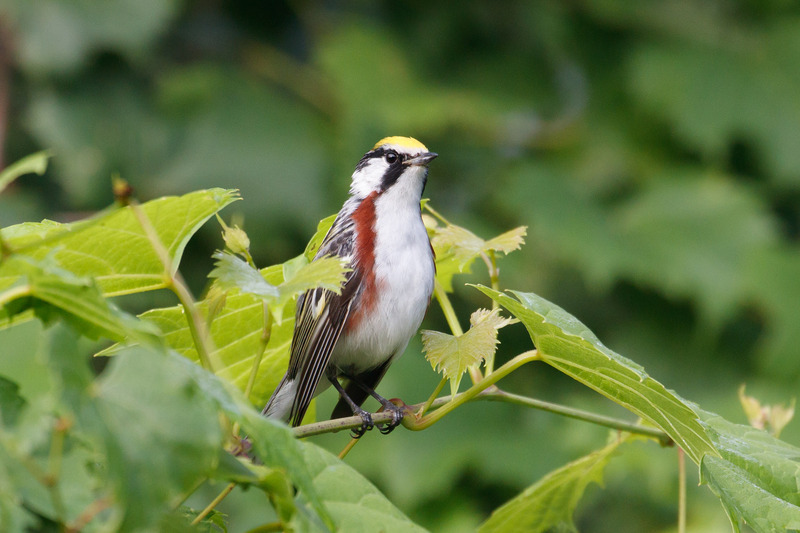 There were lots of other birds, Red-tailed Hawk, Eastern Kingbird, Eastern Bluebird, Northern Cardinal, House Wren. 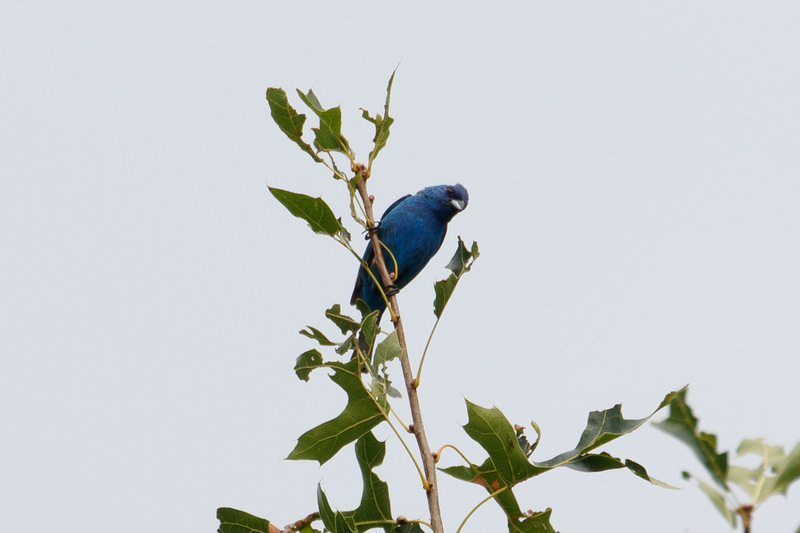 And just before we left, I heard an intriguing song that I chased down to find yet another life-bird, an Indigo Bunting! Hey-o. Birding was new again, mysteries galore and new treasures around every corner. And it wasn’t even a birding trip. We spent more time meeting friends and family, and dining on delicious arepas and Columbian spaghetti. Then Tomas and I made time to visit another park called Indian Springs Metro Park. We got a late start on this morning and it was blazing hot by the time we arrived. I had a particular sparrow in mind at this location, a Henslow’s Sparrow. There had been one sighted the day prior. 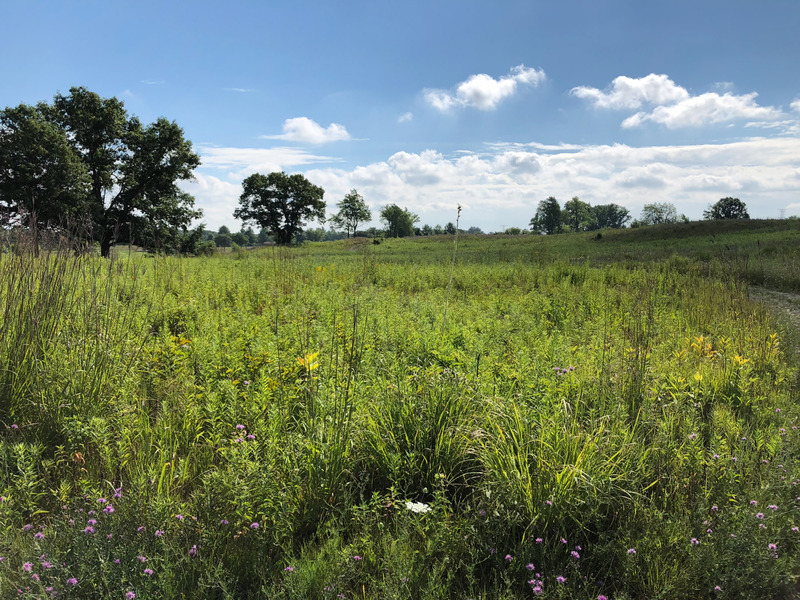 I read that they are “solitary and secretive” and prefer “damp grassy meadows with matted vegetation, weeds, and ground cover.” The park is huge and I didn’t know where to look. That plus a time crunch didn’t get me a Henslow’s Sparrow, but I did manage to find another fun sparrow that sounds like a bouncing ball. 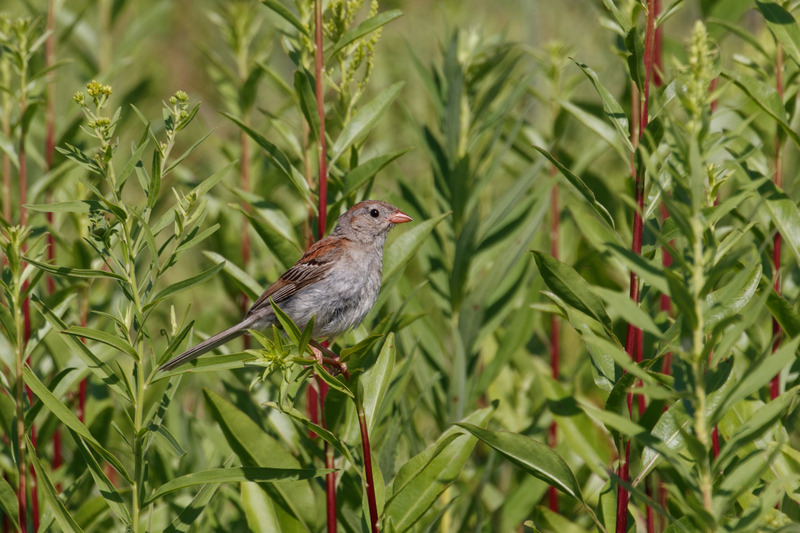 A Field Sparrow! Nice consolation sparrow. 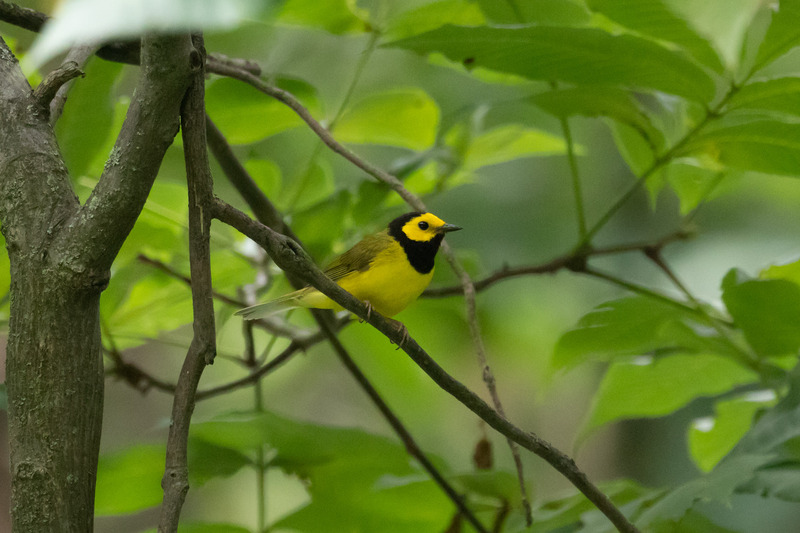 I also saw Eastern Meadowlark, Tree Swallow, Indigo Bunting, Common Yellowthroat, a Green Heron in a tree, and many many Gray Catbirds, almost as frequent as robins. 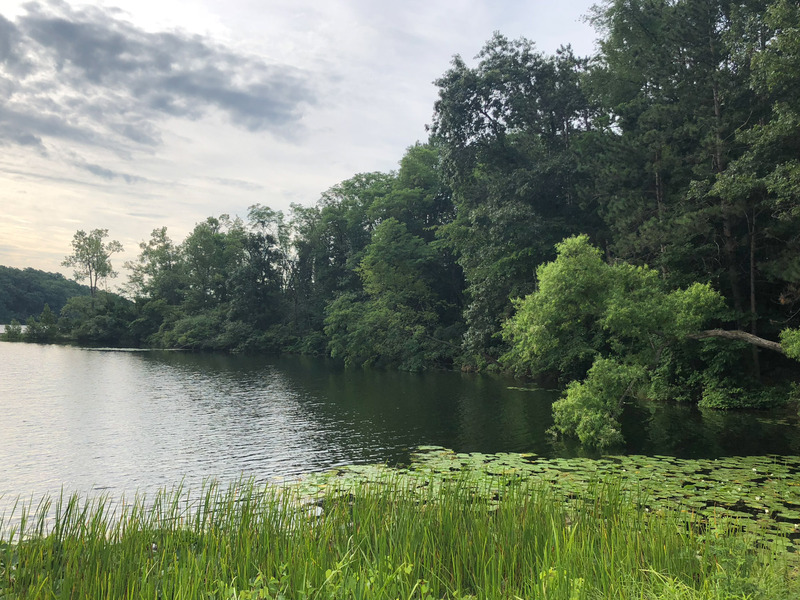 It was late afternoon by then, but we decided to stop at Holly Recreation Area on the way back and I’m so glad we did. 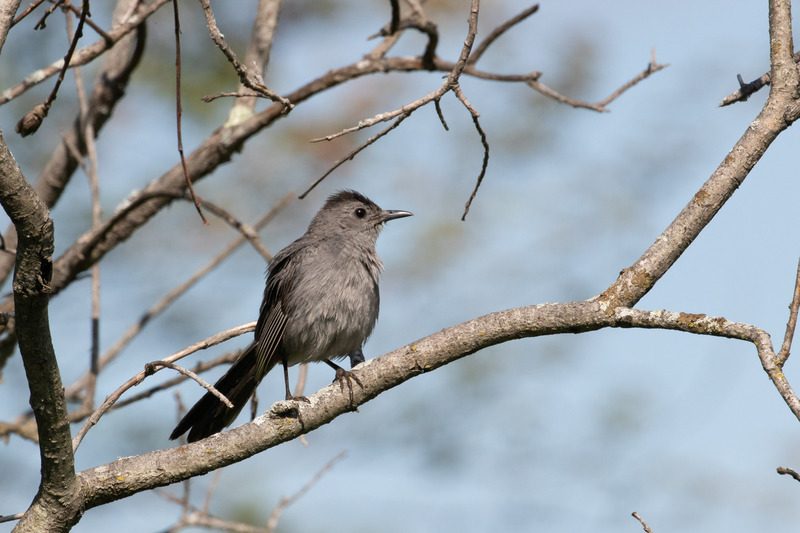 I hiked the trail through the forest down to the lake and noticed a Bushtit-sized bird flitting in the bushes. 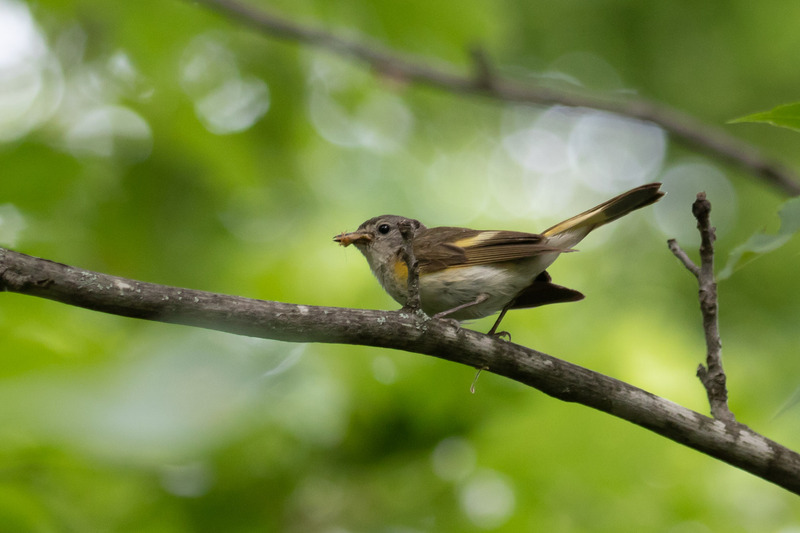 I saw a hint of yellow and couldn’t believe it, a female American Redstart! Another lifer. 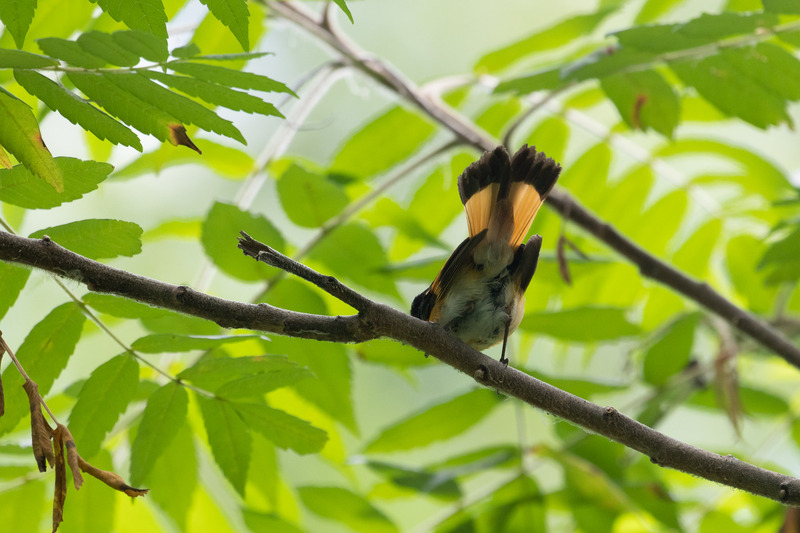 This one had a beakful of insects that it took to a nest hidden in the bushes closer to the lake. I could hear the babies begging. It took a little while longer, but I eventually saw a male too. Fanning his tail as they do to scare up insects. They move so fast in the foilage it was hard to keep up. This was the last day I had to explore Michigan’s parks and I was making the most of it. 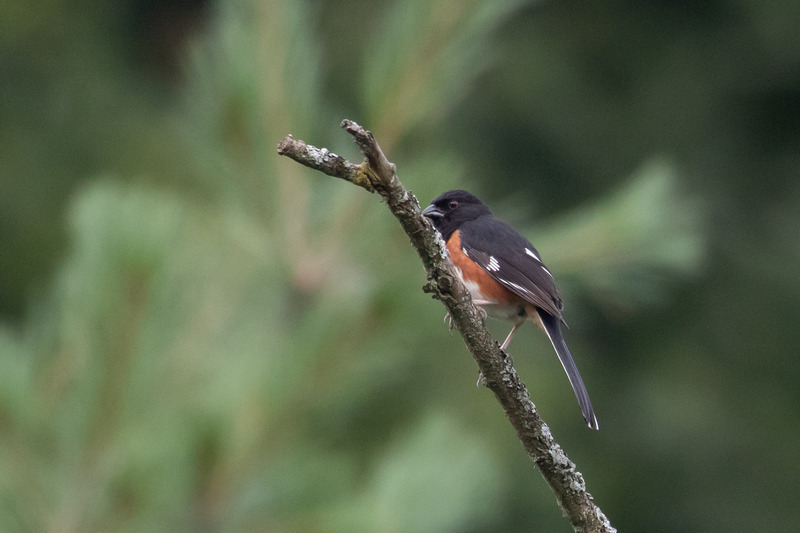 Orioles, cardinals, redstarts, I was going to miss these birds. Luckily, there was one last surprise in store. At some point I heard a warbler singing way up in the trees. Their songs sound so similar to me, especially when I’m hot, tired, or hungry and in a time crunch. But this time I stuck to it and it paid off big time. 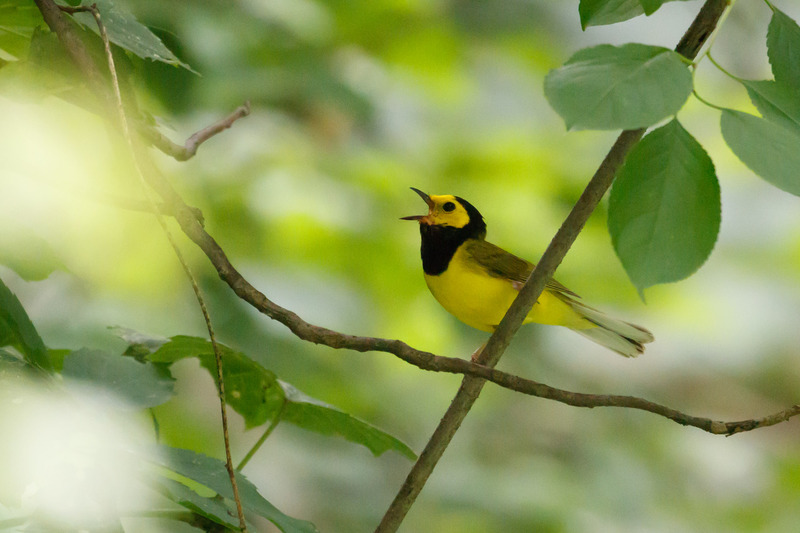 A freaking Hooded Warbler!!! My mind was blown. I tried to keep up as it moved fast through the dim forest. I couldn’t have asked for a better send-off. Who knew Michigan was so thrilling? Spring, spring, spring! Migration is happening and I’m still slowly recovering from ankle surgery. The cast is off, the boot is on, but I still can’t walk. Yet. But that doesn’t mean I can’t look at birds. At least those accessible from flat ground. Which is why I was so happy to get a message from my friend Eric alerting me to Western Bluebirds at his local (flat) patch last week. Luckily, it was on the way home from the medical supply store so I could convince Tomas to make a stop. 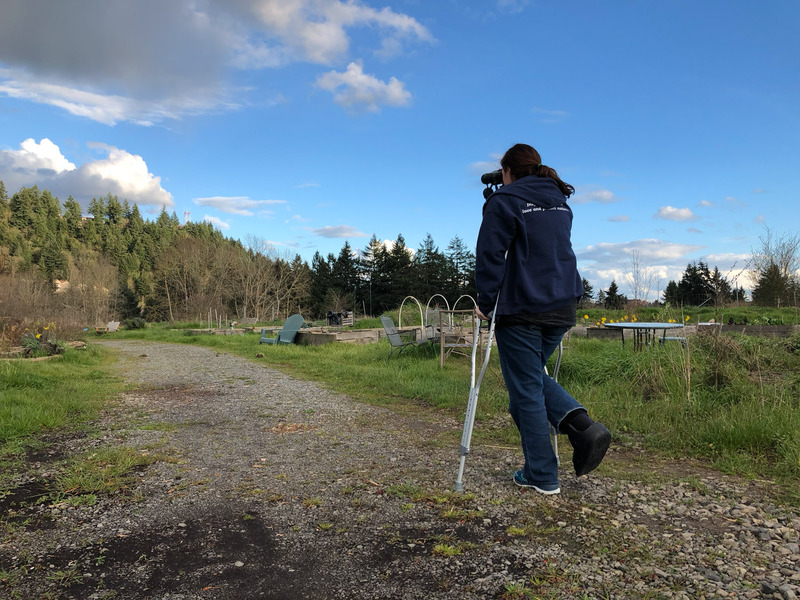 If I stood out birding before with binocs and a huge camera lens, I’m pretty much a beacon now with crutches, binoculars, and a boot. But it was totally worth it because we got the birds! Two Western Bluebirds, a new county bird for me. Since I can’t carry a camera and crutches at the same time, Tomas used a video camera to get diagnostic evidence. 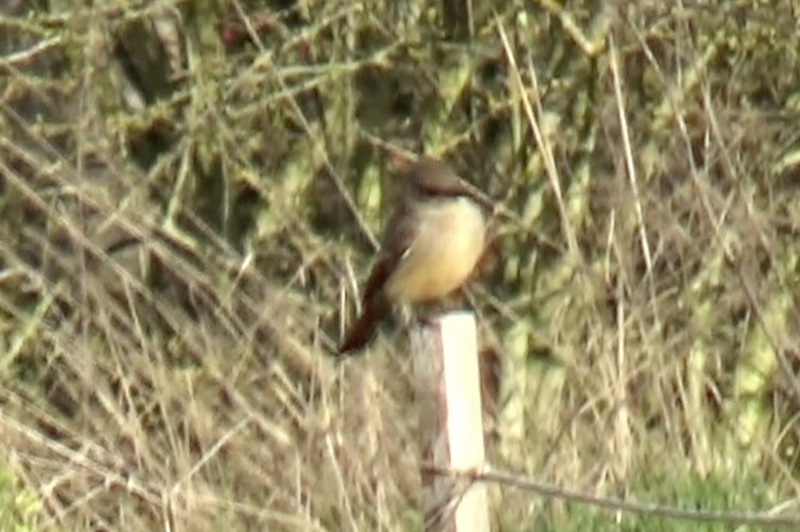 And we got a bonus Say’s Phoebe, peeping and calling. It was a good stop. Another bright spot in my week was a text from Jen giving me a heads up on a tiny owl in the neighborhood. I was at work, and since I still can’t drive and am mostly reliant on Tomas for transportation I waited patiently until we were both off of work. This time I took along my knee scooter I’ve rented to get around the office more easily. Not meant for off-roading, I took it along a paved road as far as I could before crutching the last little bit. 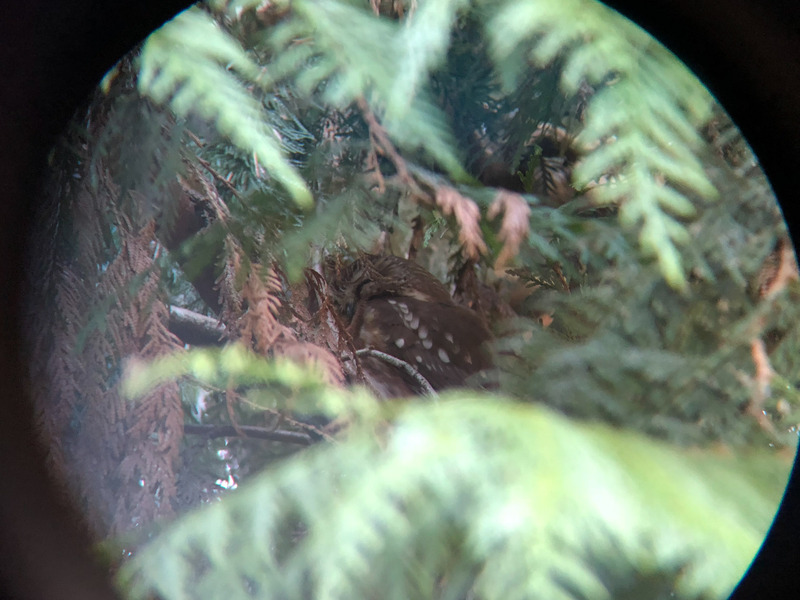 The blisters were worth it, because at the end of the trail we found the sleepy little Northern Saw-whet Owl. Tiny owls make the pain go away. 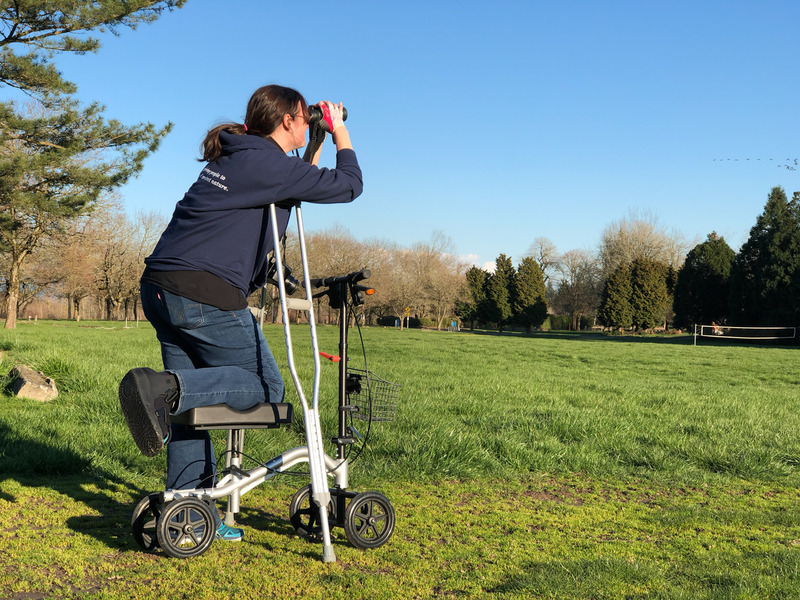 I’ve had to get creative to see some things, and I’ve missed out on others, like a county Mountain Bluebird that migrated to Powell Butte that is way to steep for me to scoot or crutch up. Hopefully I’ll get another chance. But I’m super thankful for the tips my able-bodied friends have passed along. 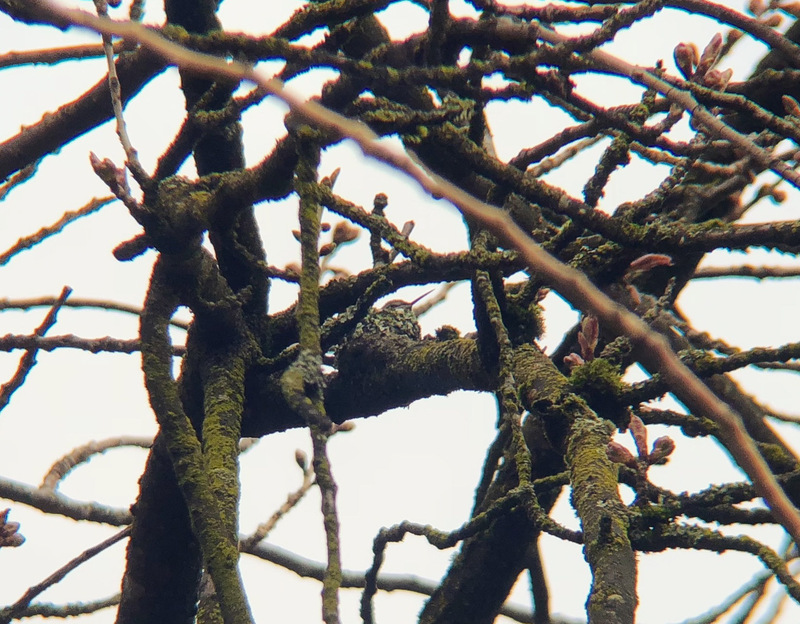 I even got a tip from a coworker of an Anna’s Hummingbird nest in the park outside our office! So adorable. I’d love to get some photos in better light before the tree leafs out. Lastly, today’s adventure started when Sarah texted me about a Sabine’s Gull in Salem. I almost didn’t go, but I happened to have the day off so I decided last minute to get a Lyft ride to her house. From there, Max, Sarah, and I went to Salem and easily got the gull. Flying around with Tree Swallows like it’s totally normal for a pelagic bird. Such fun times! Even while on crutches. A few lows, but mostly highs thanks to my supportive friends and Tomas for getting me out of the house. I didn't choose the bird life, the bird life chose me. Enter your email address to subscribe to this blog and receive Tweets and Chirps by email.